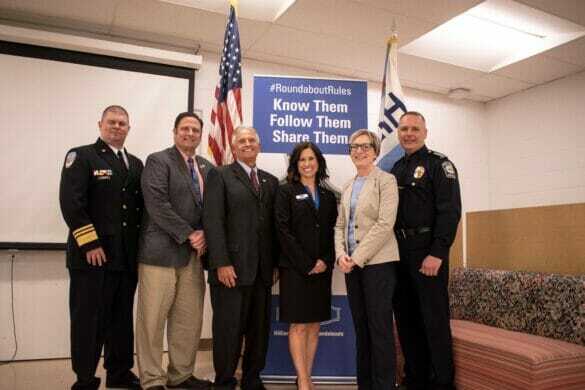 The City of Hilliard wants to inform all drivers about the rules of the road and reduce crashes in roundabouts through a #RoundaboutRules campaign. At the event, ODOT unveiled its new series of videos to demonstrate the correct way to drive a roundabout. These videos and other safe driving materials are being shared through Ohio’s Driver Education and Training Programs and with the public through a new web page currently under development. Throughout April, drivers will see more educational information from the City on how to properly use roundabouts, including temporary message board signs at certain roundabouts and a traffic blitz. Hilliard Division of Police traffic officers will be covering two of the city’s multi-lane roundabouts during morning and afternoon peak hours and sharing information cards with drivers to remind them about the #RoundaboutRules. While the City of Hilliard wants divers to know the #RoundaboutRules, it’s also important to note that roundabouts save lives. According to ODOT Highway Safety Program Manager Michelle May, 27% of all traffic deaths occur at traditional intersections. Nationally, roundabouts have been proven to reduce severe crashes at intersections by 82%. Roundabouts have decreased the severity of crashes and now it’s time to decrease fender-benders with the #RoundaboutRules campaign. For more information on roundabouts, head here.